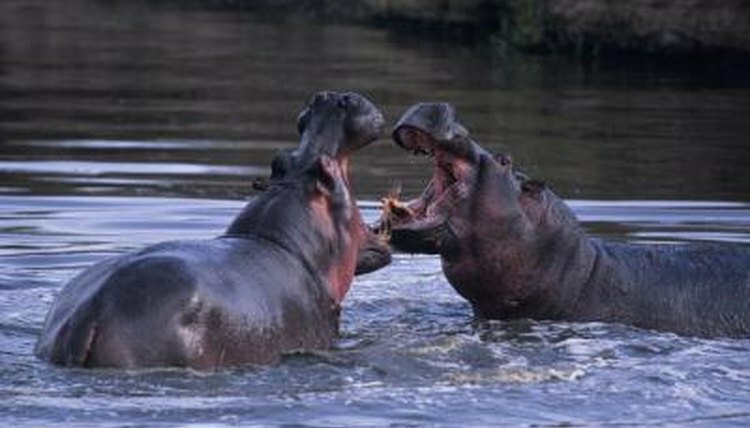 The hippopotamus's name literally means "river horse," but the enormous mammal has few traits in common with equines. Spending most of the day wallowing in shallow water in herds of up to 200 members, hippos will leave little above water level to give you clues to their genders. The subtle differences between males and females include the males' larger size and longer tusk length. But the real giveaway to hippo gender comes when you observe their behavior. Should you get too close to his females, a male hippo will let you know. If his wide-open jaws revealing tusks up to 20 inches long are not enough to get you moving in the other direction, you can also expect roars, head-shaking, and lunges, which can culminate in a potentially fatal attack. The herd is composed of mostly females with one dominant male and several subordinate males. Only the alpha male usually breeds with the females, urinating on himself and propelling his feces with his tail to impress the lucky ladies. A pregnant female hippo goes off by herself before giving birth. She'll spend the first few days on a "babymoon," bonding with her newborn and letting him gain strength before returning to the group. The independent female chooses her birthing spot based on her own preference, as hippos give birth on land or in the water. The baby spends the first few days nursing before mom introduces him to grass. The baby hippo stays near mom for up to eight months to nurse. The presence of a baby makes it easy to pick out a female adult hippo. Do Elephants Leave the Herd?